After an accident you need to bring your vehicle to a collision repair shop you can trust. When you bring your vehicle to Vogel's Collision you can be sure that you will receive service from a qualified team! Owner, Barry Holtz, along with his experienced and I-Car trained and certified technicians, have the experience needed to provide you with quality service you deserve. We take pride in our work and are dedicated to doing the best job possible. If you ever have questions about the work being done on your vehicle, we are here to answer them. No matter your collision repair needs - paint restoration, air conditioning service, or a new windshield, we can help. Since 1948, it has been our mission to provide the Rochester community with the best auto body repair services possible. 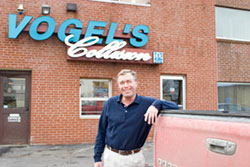 Vogel's Collision was founded in 1948 by Henry Vogel to provide the Rochester community with the best in automobile collision repair. In 1993, Henry sold the business to employee Barry Holtz who had worked at Vogel's since 1968. Through the years, Barry has continued to provide customers with the same level of excellent service that Vogel's has always been known for. Make Vogel's Collision your one-stop shop for all your collision repair and auto body needs. To make an appointment, call us at 585-482-9655 today!